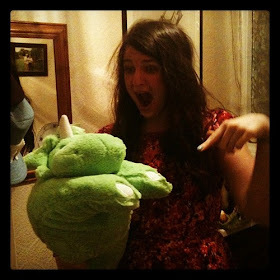 t*rexes and tiaras: Sale bargains..
What have you been buying lately? Aside from fabric, and a new mixer for the kitchen, I've picked up a few bargains in the past week or so. Obviously a trip to London would be incomplete without a trip to Oxford Street. I only had one thing in my sights, which was this Sophia Sequin Jacket from Monsoon. Luckily, the Monsoon sale began last Thursday and the Oxford Street store had the jacket in stock, as the website was sold out. I'm looking forward to finishing off just about all party outfits with this, as I think it's beautiful. From Harrod's I picked up a new shopper bag, which I'm going to try hard to remember to take with me when I go grocery shopping in an attempt to use less plastic carrier bags. I have a couple of shopper bags now, so should be able to leave at least one in the car and one with my bike, which should cover just about any eventuality. 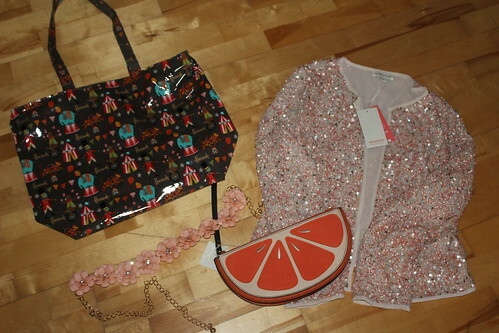 From New Look, this orange clutch bag to add to my growing collection of cutesy fruit bags. I already have an apple handbag and a watermelon clutch, but it's so cute. We did pop into Primark, which was ludicrously busy. 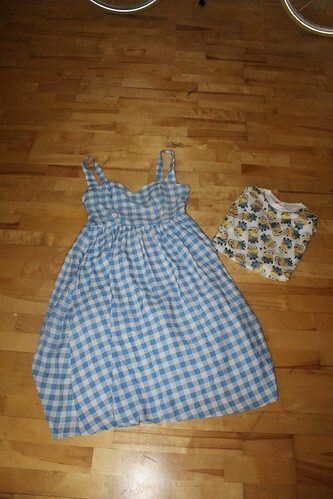 I found this gingham dress, which I've been keeping an eye out for since about March, reduced in the sale to £7. We also bought matching minion t-shirts, as we're just that cool. I love this floral belt, as well. I'm planning to dress up some of my handmade dresses with this at the waistline, to add a bit of detail. Then, on Saturday I went to drop off a couple of things at the charity shop in town, and came out with this vintage Laura Ashley dress - a steal at £9, in my opinion. I do find charity shop pricing can be so hit and miss. It's not easy to tell from the photo but the bodice has a lovely scalloped edge. I picked up even more books to add to my to-read pile. The Casual Vacancy by Rowling. J.K. ( 2013 ) Paperback has been on my radar for a while now, but I've not read it yet and I've vaguely heard of The Vintage Teacup Club . New underwear from M+S because I've recently had a clear-out to get rid of all the things which are now the wrong size, and when I was at the cafe on Saturday morning, they were giving out £5 vouchers for the lingerie section. I haven't done much sale shopping but I did get a lovely pair of chelsea boots from ASOS for half price. Don't get me started on charity shop pricing - there seems to be no rhyme or reason to most of it, I find this so frustrating. £9 for that dress is good though, you know you'll get good quality from LA. Haha, I do seem to have my charity shop blinkers on lately - I've got used to pushing past the chaff of Primark dresses for £9! What lovely, lovely things! That cardi is, as they say, to die for and I love the fruity selections. My sale shopping hit a low yesterday as what I bought over the Internet did not really resemble what arrived, either in colour or size! Absolutely thrilled with the sequins! Oh, that's so annoying when that happens - I have a Tesco order to pick up later and I'm pretty sure the shorts and playsuit are going to look dreadful on me. Ooh lovely things!! The sparkly jacket is possibly the prettiest thing ever. I've been stalking it until it went into the sale. I LOVE it. Also, I'm sure I'll be bored of the Primark dress soon, so I'll send it on.. Cute isn't it, I've been wondering about a lemon bag as well. The Primark was pretty busy but I have been in worse stores - thankfully it wasn't a Saturday! Oh i LOVE that monsoon sequin jacket, can't wait to see it in an outfit post to see how it fits :) impressive sale buys...I'm not a good sale shopper! I've been waiting for it to go down in the sale and knew I'd definitely snap it up as soon as it had! 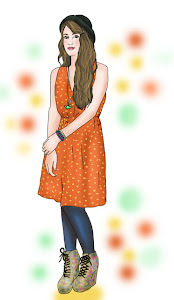 I love the orange clutch bag it is so cute and quirky, I cant wait to see it pop up in an OOTD. Thanks, I can't wait to wear it!